Here is an excellent article written by Dr. Ron Bolze, a former Executive Secretary/Treasurer of the American Shorthorn Association. This article really helped shape the organized direction of BSG in the early 2000’s, post our Junior run. Hopefully, this title has caught your attention. I think this is an issue that really needs further thought and discussion by those Shorthorn breeders that are truly interested in future potential commercial application for Shorthorn genetics. The thought process is timely in that many Shorthorn breeders will be making breeding decisions at about this time. Remember, the sire selection decisions that we make in 2006 will not create progeny that attain breeding age until 2008 in your herd and will not leave lasting impact on commercial herds until 2010 and beyond. Delaying just one year in making the right genetic decisions, delays the availability of your product to the commercial industry for another year. The point is that timely genetic decisions are critical to not only your own program, but even more so to the commercial users of your genetics. The commercial producer is the ultimate judge of whether or not your genetics and that of the Shorthorn breed have long term application to commercial production. In short, Shorthorn genetic inputs to commercial application absolutely must “work” the first time. There will be no second chances. The stimulus to write this column came from my recent travels to the Range Beef Cow Symposium (RBCS) which is held the first or second week of December every other year as a cooperative effort between the Cooperative Extension Services and Animal Science Departments of South Dakota State University, Colorado Sate University, University of Wyoming and University of Nebraska. This years’ event was held in Rapid City and typically also rotates through Cheyenne, Fort Collins and Scotts Bluff. Weather permitting, the RBCS attracts 600 – 1200 cow calf producers which represent millions of seedstock and commercial cows. Shorthorn seedstock producers that took time from their busy schedules to prioritize attendance at this year’s event include Dale Rocker, Rocker Brother’s Shorthorns, Seward, NE; Jeff Schmidt, JR Ranch, Othello, WA; and Rick Leon, Peak View Shorthorns, Fowler, CO, all of which were exposed to commercial producers considering the merits of using Shorthorn genetics in systematic crossbreeding programs. Where do Shorthorns logically fit in systematic cross breeding programs? Most breeders of all breeds of beef cattle honestly believe that their breed can do all things for all segments of commercial beef production. For example, most Shorthorn breeders would like to believe that Shorthorn genetics can do all things equally well if indeed not better than any other breed when it comes to any measure of beef production efficiency. In other words, Shorthorns are believed to be more fertile, calve easier, grow faster, have cows that excel in maternal function and longevity and hang carcasses unsurpassed for quality and yield grade and tenderness superior to any other beef breed. That is true for a few of these traits, however, a review of the Meat Animal Research Center (MARC) historical data would tell us otherwise for all traits. In fact, no single beef breed excels in all economically important beef cattle production trait. Hence, the additional need for systemic crossbreeding for commercial beef production. BW, WW, YW and most other measures of growth in beef cattle are genetically, positively correlated. For example, single trait or primary selection for yearling growth without regard for BW would likely result in greatly increased BW and resulting calving difficulty over time. In contrast, single trait or primary selection for lighter BW without regard for YW would likely result in performance depression over time. Herein lays the reason for focusing on calving ease instead of just BW. Carcass quality grade (largely marbling) is antagonistic to the components of yield grade. In other words, single trait or primary selection for carcass marbling score without regard for the components of yield grade would likely result in increased incidence of yield grade 4s. As a result of intense selection for marbling over the last 15 years, the Angus breed is now experiencing a historical high % of yield grade 4s. Systematic crossbreeding involving terminal sires on crossbred maternal females allows commercial producers to defy these genetic antagonisms for greater efficiency and “profitability” of commercial beef production. In recent years, the US beef cattle industry has focused on the “value of outputs” side of this equation. Increased “value of outputs” has been achieved through intense selection for increased growth rate (weaning weight, yearling weight, feedlot gain, etc.) and carcass merit (carcass weight, marbling, yield grade, etc.). However, our industry has focused very little attention on reducing “cost of inputs”. Profitability for a commercial producer is driven by net income after “costs of inputs” are accounted for, not gross income driven by maximum selection for the traits that contribute to “increased value of outputs”. In general, beef cattle production traits that would increase “value of outputs” are antagonistic to traits that would reduce “costs of inputs” for a commercial cow herd. In other words, intense selection for growth rate and carcass merit could be counter productive to selection for maternal function. Recognizing that different breeds excel in different traits, this is why commercial production using only a single breed does not result in the greatest “profitability”. Maternal function includes all the convenience traits that we take for granted in a beef cow. Things that we do not tend to think about until they become a problem. Things like fertility, conception rates, (with reproductive pressure of 60 days or less), pregnancy maintenance, calving ease, maternal instinct at calving, adequate milk production, udder quality, fleshing ability (with minimal supplementation), sound feet and legs, disposition, etc. which collectively contribute to cow longevity. Cow longevity is important to profitability because it reduces female replacement rate. Maternal function is the key to reducing “costs of inputs”. Should all breeds be selected for the same traits to achieve maximum production efficiency and the greatest profitability? I would contend that the English breeds (Shorthorn, Angus, Hereford, etc.) tend to excel in preweaning traits plus marbling (except for Hereford) and hence should be crossed to generate the crossbred commercial cow that excels in maternal functionality traits and maternal heterosis to yield an increased 25% lifetime productivity. This type of cow would keep the annual cow cost lower and have a reduced replacement rate due to enhanced fertility. These are the breeds that have and would respond to intense selection for the maternal functionality traits and, if properly selected would reduce the “cost of inputs”. In contrast, the exotic growth-type breeds (Charolais, Simmental, Gelbvieh, Limousin, etc.) tend to excel in postweaning traits (except marbling) and are most ideally used as “terminal” sires. These are the breeds that have and would respond to intense selection for highly heritable traits like growth, feed efficiency and carcass leanness. These are the breeds that, if properly selected would increase the “value of outputs”. To maximize profitably, a commercial cow calf producer must increase the “value of outputs” while simultaneous decreasing the “costs of inputs”. Recognizing trait antagonisms, this can not all be done in the same breed. It requires systematic cross breeding with different breeds selected for different traits. So, what does this mean for Shorthorns? As stated many times over the last 2-3 years, the Shorthorn breed is in a unique position to become the non-Angus English breed to recreate maternal heterosis in commercial beef production. In other words, if commercially oriented Shorthorn seedstock producers are willing to select for economically important beef production traits, Shorthorn bulls should be in great demand to mate to “Angusized” commercial cows to create the resulting crossbred cow that can produce 25 % more pounds of calf per cow exposed throughout her lifetime than the straight bred Angus cow. Does it mean that Shorthorn breeders should put no selection emphasis on postweaning traits like growth and carcass merit? Absolutely not. What it does mean is that Shorthorn breeders should select for postweaning traits as long as it does not interfere with maternal function. So, how do Shorthorn breeders select for maternal function? 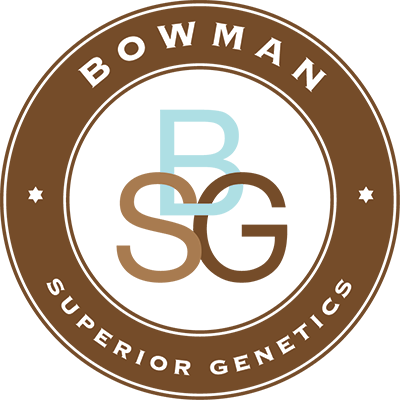 Unfortunately, current selection emphasis for many breeders from many breeds (not just Shorthorn breeders) focuses on the need to use the latest, high use genetics for merchandising purposes. The point is that genetics get used long before we know anything about maternal function of certain sire lines. The only way to select for maternal function is to use sires whose daughters excel in maternal function. Unfortunately, these sires are old and oftentimes deceased long before we recognize the value of their daughters. Artificial insemination is the answer. How about for those that do not AI. Seek out old cows from herds that are run under practical commercial like conditions � reproductive pressure (60 day breeding seasons with the opens culled), minimal supplementation to allow the environment to “sort” the cattle, intense culling for functionality traits (fleshing ability, udder quality, disposition, feet and legs, etc). There are reasons why these old cows are still in production after so many years that we will likely never be able to quantify with an EPD. Use sons out of these old, functional cows that are sired by bulls that have left daughters that excel in maternal function. Systematic crossbreeding will likely be used again by those astute commercial producers that understand the “profitability” equation. Shorthorn seed stock producers targeting genetics to these commercial producers need to have a clear understanding of where Shorthorns fit and breed the cattle accordingly. Again, the Shorthorn breed is in a unique position to become the non-Angus English breed to recreate maternal heterosis in commercial beef production. The opportunity is staring at us in the face. Will we seize the opportunity?